The Faux Wood Grain Corner Guards by Inpro are unmatched in wood grain beauty. They protect against severe blows and provide tough, corner protection. Easy to clean, permanent color, and easy to install. Looks like real wood. Can be installed using construction adhesive/liquid nails (not included) or available with peal-and-stick self adhesive. Recommended for all corners throughout any facility or home. Can the Woodland corner guard A680 able to flex enough to be used on a curve. Is it possible using a heat gun to soften the material to follow a sweeping radius? Or do you have another product that is recommended or flexible enough to be used in that application? I see that the wood grain runs the length of the corner guard. Is it possible to obtain them where the wood grain runs up and down instead? We are trying to cover bath tile that meets drywall at a corner. Can we paint the inpro corner woods to match the wall paint? Thanks. Will you please send me the following samples: honey nut amber cherry fruitwood Thank you! I need to cover at least 1-1/8" of my outside corner. Is the inside dimension of the 1-1/2 size large enough to accomplish this? Could you please send me the following color samples? Beechnut, Fruitwood, Caramel Bamboo. My address is 5 Griffin Road, Hudson NH 03051. I work at interior design company and am looking for the material for restaurant project. 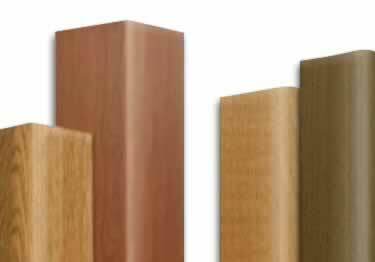 Can I get a few color samples for Inpro Corner Guards Faux Wood Grain? I would like to get samples of Coffee Bean, Honey Nut, Fruit wood, and Wisconsin Oak. Could you mail the sample to 1140 Avenue of the Americas 9F, New York, NY10036. This address is my office and the company name is National Alliance. I need them ASAP. If there is somewhere I can pick up the sample, please let me now. Thank you. Can you send me samples of Wisconsin Oak, Santa Rosa Oak, and Chatsworth Oak? Can you send samples of this corner guard in Crown Cherry, Coffee Bean, Shaker Cherry and Boston Cherry Thank you. I am a federal government employee working on a facilities project and will like to receive samples for potential business. Specifically in Inpro� Corner Guards Faux Wood Grain - #A680: Crown Cherry Coffe Bean Shaker Cherry Boston Cherry Sent to: OFA ICE 500 12th St. SW Stop 5704 Washington D.C 20536 Thank you. This corner guard was exactly what I needed. The fit was perfect and the adhesive strips made for an extremely easy installation. Great product. I thought the corner guards would be pretty thin and flimsy. But I was pleasantly surprised to see that they were thick and sturdy. They are a very nice product all the way around. great products, and Barb is great to deal with. The corners look so good and match the kitchen cherry cabinets perfectly. Thank you. These corner guards were very easy to apply and they look awesome!! I am so happy with them....and they match the rest of our wood trim in the house. The cat is disappointed because she cannot scratch them very well....but that is a huge plus for me!! Thanks so much for the great product!! I am really impressed with this product - it exceeded my hopeful expectations. I am not using it for it's original purpose, however. I just purchased a new crafted wood platform bedroom set. We live in a small place, so my computer desk and chair are at the foot of our bed. I looked around the internet to find something unobtrusive to protect the bottom of my bed from the wheels of my desk chair, and found this product. The width was what I needed and the wood design I chose actually matches the oak on my bed almost exactly. You can hardly notice that it is there and it really stands up to the scrapes and bumps of the wheels. A quality product. We were really happy to get these corner pieces. They matched up pretty well with our real wood accents on our walls and now be don't have banged up corners anymore. The pieces were really easy to cut down to fit the length of our wall so we didn't have to get custom pieces made. My only advice if you do the peel and stick is to pull the backing off slowly or else you might rip it. Was putting my house up for sale and the chipped corners of the 20-year-old kitchen cabinets looked terrible. The woodgrain match was nearly perfect and transformed look of the kitchen. The house sold in 2 days. None of this would have been possible had it not been for the patience and assistance of the wonderful Sample Lady. I was going to choose a different woodgrain (based on the pictures) than I ultimately purchased. I saw it in the samples she provided and it was way off. I would have wasted a lot of time I didn't have and been very unhappy. So, THANKS SAMPLE LADY!! InPro® Faux Wood Woodland Wall Guards protect walls while looking great! Available in 3 heights & 20 faux wood patterns.